The ability to travel freely is taken for granted in the Western World almost as a human right. For people in the Horn of Africa attempts to flee countries consumed by extreme poverty, famine, civil war and political corruption most often results in torture, slavery or death. 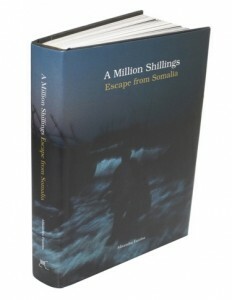 Alixandra Fazzina’s A Million Shillings, Escape from Somalia is a compelling reportage on the people smuggling trade from Bossano in Somalia across the Gulf of Eden to the coastline of Yemen. Through a prodigious body of work consisting of over 300 photographs and captions Fazzina charts the circumstances and experiences of refugees who pay at least one million Somalian shillings ($50USD) to make a journey that only one in twenty will survive. Most of the highly saturated colour photographs in this book appear to have been created at night or in makeshift shelter illuminated by rays of ambient light. The chiaroscuro of the imagery is visually seductive and may be seen as theatrical, metaphorically heightening a sense of drama pervading the individuals depicted. However, the extensively detailed captions accompanying each photograph function as a series of interlinked texts that focus the reader’s attention on the enormity of determination and tragedy fuelling the complex narratives of the individuals and events shown, debunking a response based purely on aesthetics. A Million Shillings, Escape from Somalia is a powerful rendering of the calamitous search for safety of some of the most desperate people on this planet.